Solar Consultants Brisbane Closed Down: Is my warranty valid? If you’ve been trying to contact Solar Consultants Brisbane (aka Five Star Energy), you’ll have noticed they have gone into liquidation and closed their doors in November 2014. Another Solar power sales company “gone bust” leaving customers feeling frustrated with the solar industry. However, you may still be able to claim your warranty on your inverter and panels, depending on the brand you purchased. *DISCLAIMER: MC Electrical is not affiliated with Solar Consultants or any other third party sales companies. If you have warranty or workmanship issues please seek support from your local solar electrician or review the Clean Energy Council dispute and complaints page for support options. Aurora inverter. Power-One Aurora was bought out by the huge company ABB. It is a great inverter, and ABB honour their warranties. It’s worth getting us to install a WiFi card when replacing your ABB inverter, this way your system can be remotely monitored with automated email alerts when a fault occurs. SMA inverters. SMA are an extremely reliable inverter, and they honour their warranties. If you have this inverter, it’s probably not faulty, so we’d check your panels and isolators first. Five Star Inverters. Solar Consultants imported and rebranded the JFY inverter. You should be able to claim it from JFY (below). JFY inverters. JingFuYuan inverters (including the JFI, Suntree and Suntwins range) are still disturbingly prevalent in Australia. If you have a JFY inverter, it’s probably faulty. Claiming warranties is difficult when you tell them you bought it off a company that has since closed down. You may end up cutting your losses and replacing it with a real inverter, but we’ll help you fight the good fight if you choose to try and claim the warranty. Sunny Roo or Sunna inverters. These inverters were mainly imported by Beyond Building but installed also by other companies including Metro Electrical and Solar Consultants. The inverters disappeared in 2012 along with Beyond Building. They were a dodgy inverter to say the least. You won’t be able to claim a warranty with these inverters. Consider yourself lucky that it lasted this long! STS panels. Model STS-6M-260M-60 (or Zhejiang Jingshang panels). Five Star Panels. Solar Consultants imported and rebranded these panels, so your warranty went bust with them. Tianneng TNS panels. These may have been their worst panels. We have had no luck with manufacturer warranties. Hanover (a German sounding cheap Chinese panel) – PowerArc (a reputable solar wholesaler) still sell these panels, claiming your manufacturer warranty should ok.
Rise Solar. (Ningbo Xinyou Model XY250-60F/M6) – Rise Solar still operates Victoria, Australia – but we have had no luck getting even a single panel replaced. We’re happy to try again. Solar Consultants use subcontractors to do their installations. For a short time, MC Electrical was one of their sub-contractors. If we installed your system, we will honour any workmanship warranty. However at the time we parted ways with Solar Consultants, the price they were paying installers was, well, ridiculous. There was no way an Electrical contractor could install to a high standard, with high-quality isolators, etc., and still make a profit. As a result, many of the installations carried out by their sub-contractors had substandard workmanship. In some ways, this may be good news as installation faults are often the least expensive to fix. If you have warranty or workmanship issues please seek support from your local solar electrician or review the Clean Energy Council dispute and complaints page for support options. 9 Comments on Solar Consultants Brisbane Closed Down: Is my warranty valid? have you come across this panel before bar code TMXUUMCABEAIBB1005. this panel was sold through five star energy ( solar consultants ). customer need a replacement panel. they have one panel with hot spots. Hi, I live in the Lockyer Valley. I used Solar Consultants to install a 5.5kw system (22 panels) with an Aurora inverter. I think installation was about 2013. However, I was not really happy with the sub-contractors as I had to assist them to install the panels on my farm shed roof. The system did not work for the first 2 months but was apparently rectified after that. For about 18 months, we have been getting far less power generation than we were sold, particularly with the add on 2 panels. Now, I've just had our local electrician look at the power board/inverter. He believes it is not working or intermittently. Help!!! Hi Guys. In Nov 2013 I had Solar Consultants install a 5kw system with an Aurora Inverter. All was going well until this week. Found the inverter red LED on with "riso low" being displayed. Read the manufacturers book for guidance to diagnose the fault. Being a sparkie myself I disconnected each of the two banks of solar panels in turn but the result was the same. Looks like the fault is with the inverter. Need an expert to check it out and advise asap. Hi Darryl Dunn. Apologies for the late reply. About $2000 to get a quality inverter like the Fronius supplied and installed. But we would want to test the panels it before we replaced the inverter. Hi Roy, We'll give you a call on Monday, or call us on 07 32683836. What is a CEC Retailer? I selected MC Electrical over other solar companies for a few reasons. When you are spending a significant amount of money, the value of having a representative come to your home at the prearranged time, to explain the various options and assist with the decision making that is in your best interests is worth a premium over other "over the phone" installer options. Assurances regarding the quality of work using in house installer teams plus the benefit of using a local supplier who designs, sells and maintains systems should I ever need assistance. I understand the installers come and go in a highly cost competitive business, but I reasoned that my money spent locally benefits locals and is a small insurance for the future. From the sales staff to the installers, all have treated me with courtesy and respect, been responsive to my queries and kept me well informed throughout. Recommended without reservation. Yorik, Mark and the whole team did a brilliant job on our Solar System, very happy and would highly recommend this company. Looking forward to lower power bills now! Starting from zero I did lots of research to bring myself up to speed on solar. I read all the posts on the MC Electrical blog amongst other stuff. I wanted a top quality install (no leaks) that would be backed later on if ever needed. I looked into the companies friends had used and found some of them were no longer trading - not ideal. I also wanted quality gear that would return on investment long term - I'm happy with our system. MCE built on my confidence as I progressed through the learning process; in the end the decision was easy and the install was smooth and highly professional. thanks MCE. 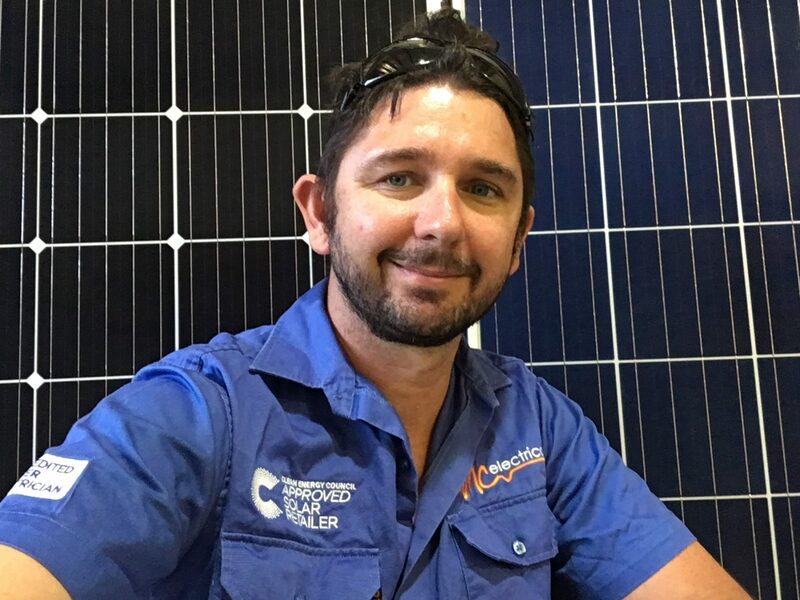 Join our mailing list to receive the latest information, reviews and solar industry insights from MC Electrical owner Mark Cavanagh.